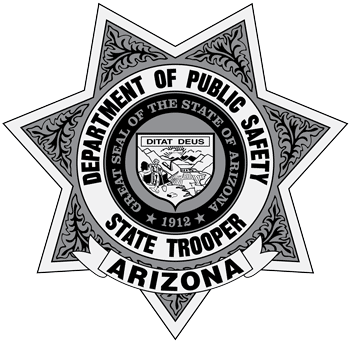 Statewide – Arizona Department of Public Safety (AZDPS) Troopers have investigated 117 fatal collisions resulting in 145 deaths during 2016. During that same period from January to June 2015, 39 drivers and passengers died not wearing safety restraints. ***Updated*** by Raul Garcia, Public Information Officer, on June 24, 2016, at 1:25 a.m.
Trooper Rodriguez was released from the hospital on June 23, 2016. Tonopah, Ariz.-Two young ladies died in a horrific collision when a wrong way driver struck them head-on. A third passenger was critically injured with life-threatening injuries. The wrong way driver also died. ***Updated*** by Captain Damon Cecil - April 8, 2016 1:45 p.m.
Marana, AZ – A vehicle drove westbound in the eastbound lanes of Interstate 10 at Milepost 242 when it collided with another vehicle driving eastbound. Drivers of both vehicles died at the scene. Updated at 8:00 p.m. by Raul Garcia, Public Information Officer. Yavapai County — Just before 6 a.m on Saturday, Aug. 22, Arizona State troopers received 911 reports of a wrong-way truck traveling northbound within the southbound traffic lanes of I-17 at milepost 244 near Black Canyon City. Statewide - Arizona Department of Public Safety (AZDPS) Troopers have responded to more than 840 calls for wrong way drivers in 2016. In the last two weeks alone, two troopers have been injured while intervening to stop wrong way drivers. Phoenix — Arizona Department of Public Safety (AZDPS) Detectives have arrested two men in connection with a road rage incident that occurred June 28th in the westbound lanes of Interstate 10 near 43rd Avenue.